While the US should be commended for backing Burma’s democratic transition, future support should be conditional on further political reforms. As a former political prisoner and a democracy activist involved in civil society initiatives, I wish to express my sincere gratitude to the United States and international community for their ongoing support of my home country of Burma and our longstanding struggle for democracy. Since the 2011 release of Aung San Suu Kyi and the visit of then-Secretary of State Hilary Clinton, Burma’s political transition has become one of the biggest hot-button issues of our time, both within and beyond our borders. Between 2010 and 2012, we witnessed undeniable progress. As of December 2013, 1,300 political prisoners had been released, including Min Ko Naing and other activists who had been arrested during the 2007 Saffron Revolution. In addition, the National League for Democracy was allowed to once again register as a political party after years of struggle. Government media censorship eased, and members of the opposition were finally allowed to obtain passports. As a result of this opening, Burmese government officials once condemned by the West now freely visit the Western world. The United States and Canada promote diplomatic relations with Burma and have opened new embassies and consulates in the country. What’s more, the United States has eased its sanctions, and international expertise and investment are pouring in. Since 2012, I have been recommending that the West engage with Burma by strengthening civil society organizations through education and capacity building. Humanitarian aid alone cannot ensure a democratic transition while the military remains the strongest actor in the country. Instead, we must address the implementation of human rights and democratic principles across all levels of government while supporting civil society organizations and activists. In hailing Burma’s recent political liberalization, we must exercise caution. The central question is whether this liberalization is on the right track toward a democratic transition or simply leading to another type of authoritarianism. We need to closely review the so-called reform agenda, which is still very much in its initial stages. Before fully embracing the Burmese government as a democratic partner, the United States must revisit its carrot and stick policy, which has, of late, been much more carrot than stick. Instead of a credible “stick,” we have seen an overall lack of accountability toward the regime. There are at least five reasons for Washington to reconsider its current approach. First, three years after the signing of a ceasefire agreement in 2011, fighting continues in Kachin and Shan States, and the number of internally displaced people grows as new generations are born into camps. Of course, they need urgent humanitarian support, but in the long term, they need real, actionable peace. Second, the military’s widespread confiscation of land goes unaddressed, while at the same time people are arrested simply for taking part in demonstrations against this practice. In Kantbalu Township, 56 people were arrested earlier this year for protesting the seizure of their land. Third, optimism over the loosening of media restrictions is premature. Journalists are still regularly arrested on false criminal charges, and in October, freelance journalist Ko Par Gyi was tortured and killed by the military while reporting from conflict areas in Mon and Karen States. Fourth, In the midst of growing sectarian violence, in which Muslims serve as scapegoats for national issues, President Thein Sein has submitted a controversial anti-interfaith marriage law to parliament. This law targets Buddhist women’s right to self-determination, while the true instigators of communal violence act with impunity. Finally, human rights activists, especially women, face harassment and death threats from ultra-nationalist groups. Appeals to police for legal protection go unanswered. 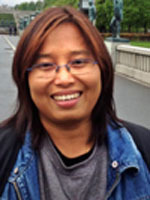 Zin Mar Aung is a former political prisoner and human rights activist who co-founded the Rainfall Gender Studies group and won an International Women of Courage Award in 2012.